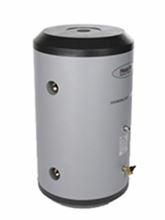 Heat-Flo 316 Stainless Steel Hydronic Buffer Tank with 60 Gallons, 1-1/2 inch Connections and 4 Taps - HF-60-BT-112. The primary application for the HF-60-BT-112 is to reduce low-mass modulating, condensing boiler short cycling. The supply side of the boiler is piped through your closely spaced tees and then to the top of the tank. The lower side port is then piped to the return port on the boiler.